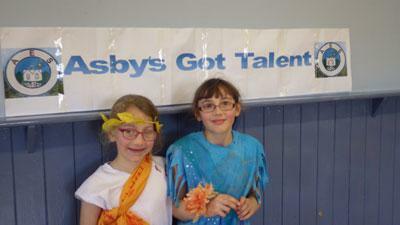 On Friday 22nd April the children organised their very own Talent Show. Mrs Heron and the school council did a lot of the organising and it was a great success. We had some excellent judges - thanks go to June and Valerie, they did a superb job and gave the children some lovely feedback after their acts. In first place we had Darcey and Sarah’s act ‘How to look after a baby’. This was a superb comedy sketch with some great acting! In second place we had ‘The Snowman’ where Tiegan played her violin, along with Jay and Oleina who brought the story to life with their acting. 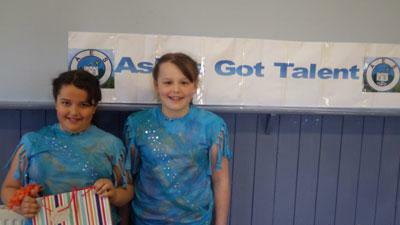 In third place we had the ‘Gymnastic Twins’, which was Sophie and Bethany who performed their floor routine to music. To close the show Key stage 2 performed their U.Dance routine to the parents and guests, it was lovely to see this for the final time after all of their hard work was put into performing at the Sands Centre last month. Any donations given by the parents and friends are being put towards Cancer Research UK. 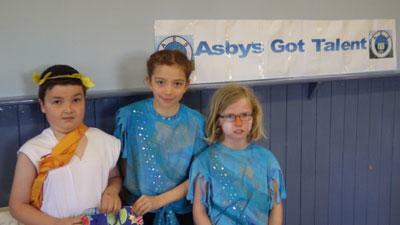 Many thanks to everyone who supported the event the children really did themselves proud, Asby DOES have talent!